You can bounce bubbles up and down off your clothing – if you’re wearing all natural fibres. Bubbles will bounce off cotton or wool, and break on most synthetics. They will also bounce off wet skin! You can blow bubbles with your bare hands, as long as you can create an enclosed shape with your fingers. Dip your hands up to your wrists in bubble solution and try out different shapes. Your hands have to be dripping wet for this to work. You can also try catching bubbles, and making them jiggle and dance in your hands. Any object that is wet enough can go through a bubble without popping it, no matter how pointy! Dip a pencil in bubble solution and then slowly poke it through the bubble. 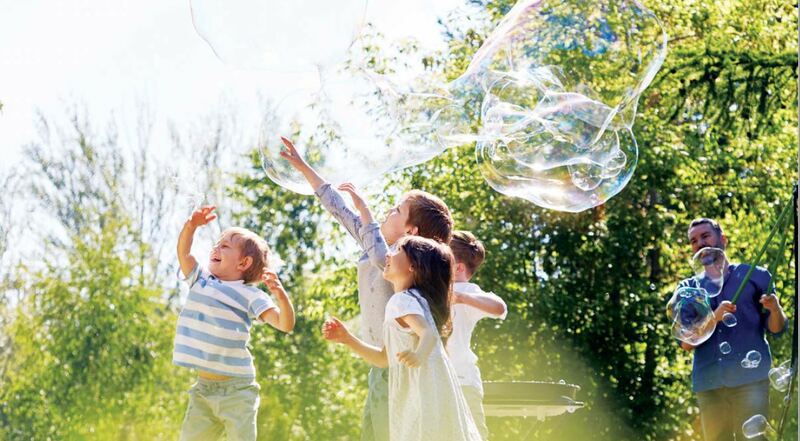 Try making big bubbles and blowing little ones inside of them. Can you blow a bubble dome on a dish? What about a chain of bubbles? What happens if you take two bubbles and hit them together (if you’re gentle, they should form into one big bubble!). Pull a bubble apart, or karate chop it in half. Can you build a bubble snowman? The possibilities are only limited by the imagination. Remember, working with bubbles requires kids to be gentle. I tell children that bubbles are shy, so we should try not to scare them! It’s important to avoid blowing too fast. And don’t get discouraged – it takes practice and experimentation to do some of these tricks. Now that you know a few secrets of bubbleology, experiment all you can!